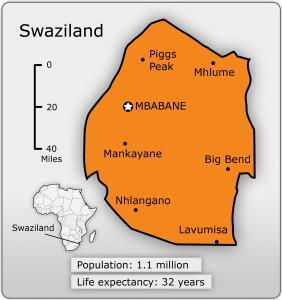 So here are the facts on Swaziland: it’s a land-locked Southern African country with the highest HIV prevalence on Earth. About 1.1 million people live in this Kingdom country, the only fully autocratic, hereditary monarchy left on the planet. Earlier this year, profound budget shortfalls led to service cuts and requests for new loans from international agencies and South Africa. Life expectancy is 32 years old. Meanwhile, King Mswati III, in power since the age of 18, maintains a fortune inherited in trust for the Swazi nation of at least $100 million, which he has used to build multiple palaces and to maintain his private jet. This year, as I’ve written about a few times, Swazi citizens have begun to protest, but each time, the state has deployed massive repression to keep people at home. Yesterday, the UN news service wrote about a bleak outlook for food security in the face of archaic agriculture (no irrigation systems, planting that relies wholly on rain, very little secure land tenure) and increasingly erratic rains. 1. Domestic protests aren’t loud enough – this looks nothing like the Arab protests. To be certain, there have not been massive uprisings, which might suggest that citizens are not nearly as unhappy as the Egyptians or the Syrians. Well, there is the issue that Mswati is still a hereditary monarch in an almost completely homogeneous Swazi country, so indeed, citizens do view him as a legitimate leader. Also, there is the fact that a huge proportion of the adult population is very poor and hungry, HIV-positive, or both, and may simply be too weak or too pre-occupied to protest. 2. Swaziland is in South Africa’s orbit, and South Africa is too nervous to intervene. If Swaziland were outside the sphere of a major African power – let’s say it were out in Central Africa – the U.N., U.S. or the E.U. might feel that they could and should parachute in and help out. But these Western countries most likely feel that this is South Africa’s and Southern Africa’s business, the same way the Zimbabwean quagmire has largely been delegated to the region. In this case, South Africa is not defending Mswati based on the brotherhood of liberation leaders (as is the case with Mugabe), but I imagine that there remains general sensitivity about violations of the norm of state sovereignty, particularly given South Africa’s large Swazi population. One sad irony is that if Swaziland had been incorporated into South Africa rather than becoming the sovereign nation that it is, I think the plight of Swazi citizens would be far better today (though they would have lived under the boot of apartheid for a few decades which would not have been a very good price to pay). 3. Swaziland is a homogeneous country. I am betting that if Swaziland were an ethnically diverse country, the outrageous pattern of rule would likely be described as some type of ethnic oppression and the situation would have caught the imagination of more outside powers and news media. 4. Swaziland is small and contains few valuable resources. Admittedly, outside powers are between a bit of a rock and a hard place. The most promising initiative for political change appeared when the South African labor confederation, COSATU, began to get involved. But the resources committed appear to have been small, and there has not been much progress. Shortages of ARV drugs may lead some HIV activists to protest, but I fear that the general enthusiasm around and empathy for AIDS activism is simply not what it once was.